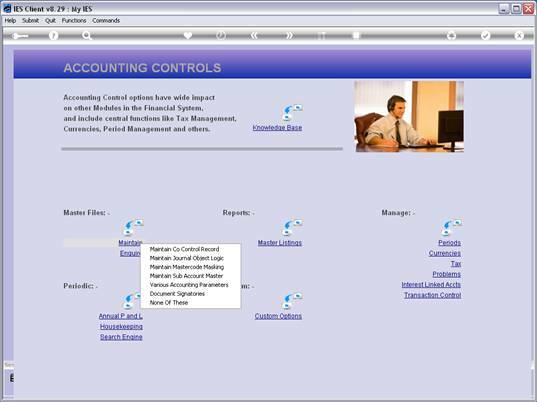 Slide notes: At Accounting Controls, from the Master Files menu, we find an option called 'Various Accounting Parameters'. This is an important option that is ALWAYS used during the set up of a Company, and it may also be re-visited at any time to adjust any of the settings. Slide notes: The Set Up type is selected from a drop list, in keeping with the Business type. Slide notes: The Payroll, if to be used, is also selected from the available Types. Slide notes: Country and Currency settings are in accordance with the Country of domicile for the Company. Slide notes: Next, we have the settings that determine how Withholding Tax will operate, if used. Slide notes: The Consolidator is only checked for Consolidation Datamarts, and not for usual business. 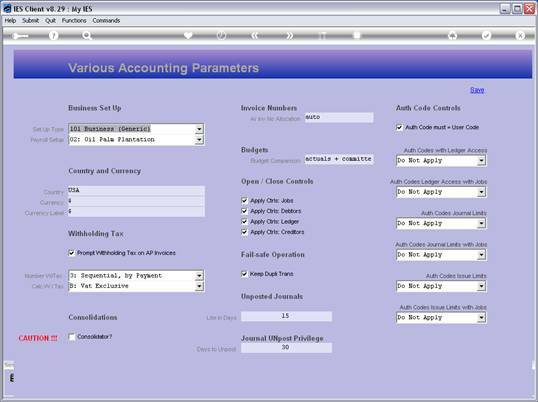 the other types of AR Invoices that are generated from various Modules. Slide notes: The Budget Comparison setting is usually for Actuals PLUS Committed, but it is not the only choice. In fact, for any and all of the settings on this control record, it is important to consult the on-line Help to understand the available choices and the impact thereof. 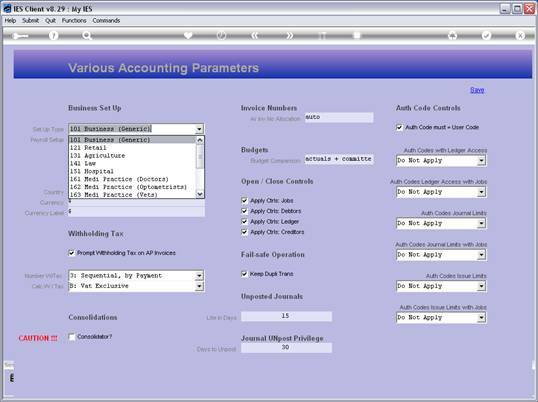 Slide notes: 'Open and Close' controls may be selected for certain Account Types. Slide notes: And fail-safe duplication of base Transactions is recommended but nevertheless optional. Slide notes: Authority Code settings with Journal Processing are regulated according to the settings chosen here. Slide notes: So, the Various Accounting Parameters option really do include a variety of system settings to be selected for a Company's Accounts set up.